Who does not love elegant cards? I know I do, especially when they are easy to make. Elegant cards are often about layering intricate die-cuts. 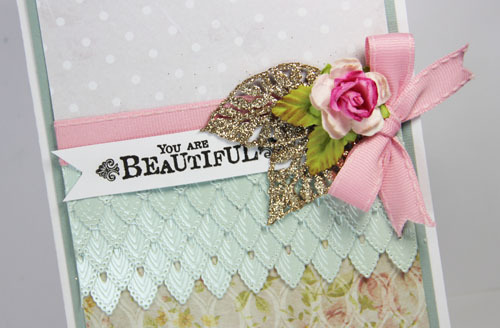 Yvonne here to show you how to make a card with a simple layering technique. For my card, I “think outside the box” with a fold-flower die cut as a ruffle and using E-Z Runner® Grand Refillable Dispenser and Dodz Adhesive Dots Medium ? On a white rectangle card base, adhere a slightly smaller piece of grey cardstock as a card panel with the E-Z Runner® Grand Refillable Dispenser. Put together two pieces of patterned papers (a dotted and a floral pattern) and cut to slightly be smaller than the grey panel. Die-cut borders and layer them one row after another, like ruffles, onto the lower side of card panel. Secure with the E-Z Runner® Grand Refillable Dispenser. Next, adhere the layered panel (the floral pattern half) onto the card base with the E-Z Runner® Grand Refillable Dispenser. Wrap a piece of pink ribbon at the bottom edge of the dotted pattern half) and adhere the ends to the back of the cardstock with the E-Z Runner® Grand Refillable Dispenser and then adhere to the card base to create one whole card panel. Stamp a sentiment, cut to a banner shape, bend slightly for dimension before adhering to the card with two Dodz Adhesive Dots Medium. 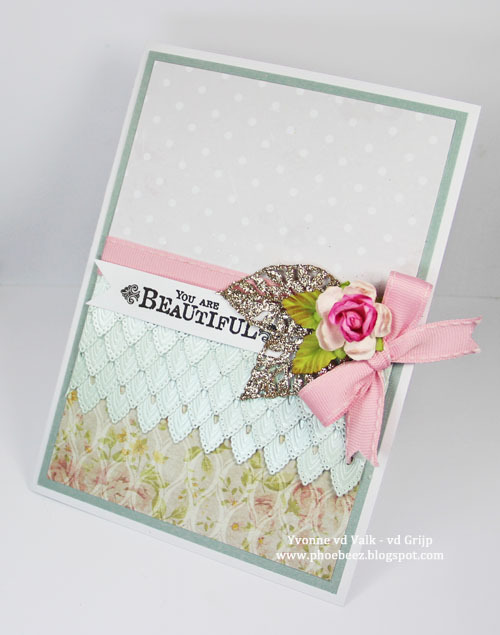 Use the adhesive dots to adhere the mulberry flower, leaves, and bow to the card base. And voila….you have finished making the card! I hope you enjoyed making the card and hope you got inspired creating your own special card. Thanks for stopping by and wishing you happy crafting! This entry was posted in Adhesive Dots & Lines, Adhesives, Cards, Crafts & Tutorials, E-Z Runner® Grand and tagged Adhesive Dots Medium, Adhesive Value Pack, Card, Card Making, E-Z Runner Grand Dispenser, E-Z Runner Grand Permanent Strips Refill, E-Z Runner Permanent Strips, E-Z Runner Permanent Strips Refill, E-Z Runner Permanent Strips Refillable, E-Z Runner Permanent Strips Refillable Value Pack, Spellbinders Paper Arts, Yvonne van de Grijp. Bookmark the permalink.